This is a very short puzzle. You win or lose it within 5 min. Only for those who can think out of the box. The time limit is far too small. I barely made it on Easy level, and even on Normal it seems impossible to complete the mission in time. I found no balance problems. It seems that the mission would be feasible even on Very Hard, if not for the time limit. Thinking outside the box is absolutely required, just as promised. You start with no army and abysmal popularity, and you cannot hire soldiers. Yet it is possible to defeat the enemy army. 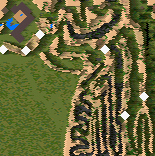 The map looks plain ugly — flat terrain with natural walls forming a maze. Then again, there definitely was some effort invested into the design, as both the flat terrain and the maze play very important roles and have to be used for a chance of winning. There is no story, and no story is needed: this map is just a puzzle, showcasing one of the less noticed aspects of the game. Definitely worth playing, despite the ugly look and the unreasonable time limit. Applause to a funny and entertaining short scenario! Open your gates and let the enemy enter your castle ... the woodcutters' axes will await them!